The Pokémon Bank is a downloadable online application for the Nintendo 3DS that is available in the Nintendo eShop and was made compatible with Pokémon Sun & Moon in January 2017. The Pokémon Bank serves as a complement to the Pokémon Storage System, and is compatible with Pokémon X and Y, Pokémon Omega Ruby and Alpha Sapphire, and Pokémon Sun and Moon. 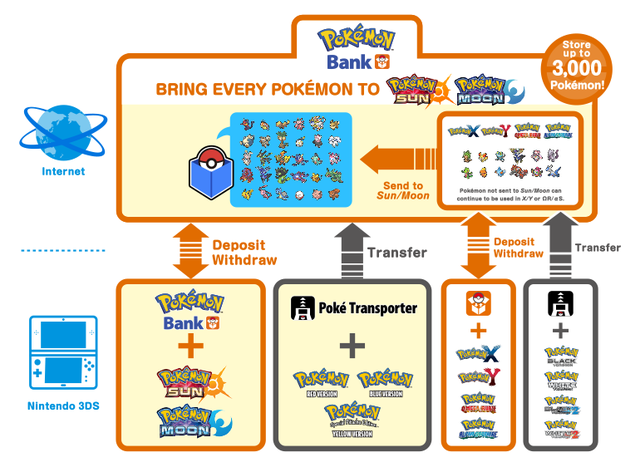 Pokémon Bank allows players to store up to 3000 Pokémon from the games in an online cloud. This storage is similar to the Pokémon Storage System provided by PCs and has 100 Boxes capable of carrying 30 Pokémon each. Boxes can also be assigned to one of 10 groups with customizable names. Pokémon Bank also features extensive search options and filters. Pokémon in the Generation VI and VII games can be transferred to the service individually or by group selection. Due to server expenses, use of the software requires the payment of an annual fee. This fee is ¥500 in Japan, $4.99 in the United States, $6.29 plus tax in Canada, £4.49 in the United Kingdom, €4.99 in Europe, $6.50 in Australia, $8.50 in New Zealand, ₩5000 in South Korea, $150 in Taiwan, and $40 in Hong Kong. Poké Transporter is a companion application that allows the transfer of Pokémon from Generation V games (Pokémon Black and White, and Pokémon Black 2 and White 2), and the Virtual Console releases of Pokémon Red, Blue, and Yellow to Pokémon Bank. It can be downloaded separately after Pokémon Bank has been downloaded. A 101st Box in Pokémon Bank is reserved for use by Poké Transporter. Within Pokémon Bank, this Box can only be withdrawn from. Pokémon can be freely transferred between Pokémon X and Y and Omega Ruby and Alpha Sapphire. Pokémon from both these games can be transferred to Pokémon Sun and Moon, but cannot be transferred back. Pokémon from Pokémon Black and White and Black 2 and White 2 can be transferred to Pokémon X and Y, Omega Ruby and Sapphire, and Sun and Moon. These Pokémon can also not be transferred back. Pokémon from the Virtual Console versions of Pokémon Red, Blue, or Yellow can only be transferred to Pokémon Sun and Moon, and can also not be transferred back. You also can’t deposit Pokémon holding items into Pokémon Bank. If you try to deposit a Pokémon with a held item, that item will be sent back to the original game. Another thing to note is that Pokémon that evolve via trading will not evolve when deposited in or withdrawn from Pokémon Bank. Finally, Cosplay Pikachu, Black Kyurem, and White Kyurem cannot be deposited in Pokémon Bank. When depositing Pokémon for the first time into Pokémon Bank, you receive 100 Poké Miles. Additional Poké Miles are awared for the length of time that a given Pokémon is deposited into Pokémon Bank. The amount of Poké Miles earned increases if more Pokémon are deposited into Pokémon Bank. Accumulated Poké Miles may be transferred to the currently selected game via Pokémon Link, either directly as Poké Miles or as Battle Points (at a rate of 1 Battle Point for every 10 Poké Miles). If you choose not to transfer your Poké Miles, they will simply continue to accumulate. If you use Pokémon Bank before October 2017, you will receive a Mewnium Z. After the January 2017 update, Pokémon Bank received a National Pokédex feature, which can be accessed by pressing the Y button. This feature reads your saved data from any compatible games you connect with and collects the information about Pokémon you've caught. This way you're able to see information about all the Pokémon you've caught in all your compatible games (Only Sun & Moon, Omega Ruby & Alpha Sapphire, X & Y). Next to the National Pokédex feature, you're also able to view Adventure records when pressing Y. This gives you a list of your in-game records, like the amount of Pokémon you've caught, Eggs you've hatched, Pokémon you've evolved, etc. On the top screen you can see each record for each game you own.